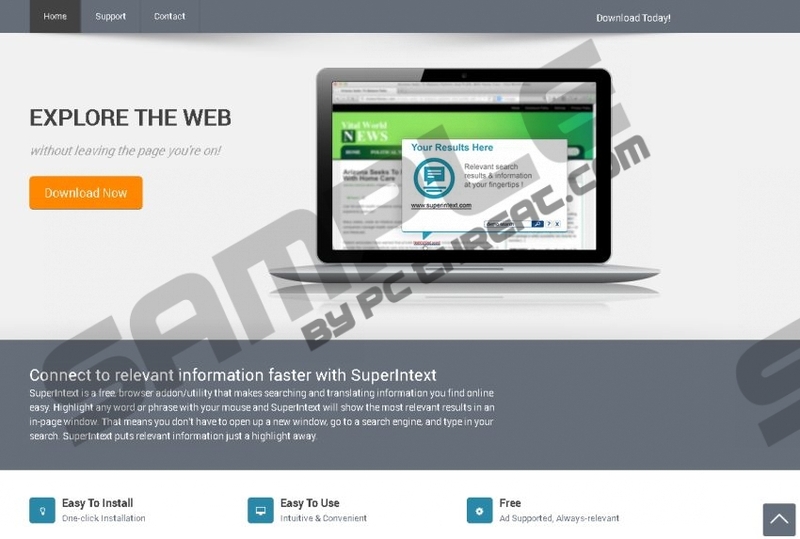 SuperIntext is a browser extension created on the Crossrider platform and offered at superintext.com. According to the recent research, this application could be installed packaged with other programs; however, it is unlikely that it will be installed silently, without your knowledge. All in all, if you install the application onto the computer, you probably hope the tool to enhance your web searches. If this were the case, people would not rush to remove SuperIntext from their operating systems. Once SuperIntext is installed onto your personal computer, it starts collecting information related to your virtual activity. This is done with the help of web cookies which are installed together with the application. Even though it is unlikely that these cookies would collect personal, sensitive information, you should delete them if you are not comfortable with this activity. Of course, if you delete SuperIntext cookies, there will be no point in running the application on the operating system altogether. Advertisement-supported programs use web cookies to learn more about you and your virtual habits. This is supposed to help SuperIntext provide better services. In reality, the program simply underlines random words on the web page you visit to present different offers. These are most likely to promote the services of third parties, and if you know nothing about them, we suggest you remove adware instead of trusting highly suspicious pop-up ads which are unlikely to offer you anything beneficial. In rare cases computer users stress about SuperIntext removal because they find it running on their operating systems without permission. If your personal computer cannot be accessed by other people, and you are sure that you have not downloaded it yourself, you need to consider the possibility that you have installed the application without realizing it. If this is the situation you face, you can install a malware scanner to find out if you should remove other suspicious applications. The uninstall entry for the program is listed as ‘SuperIntext staging’. Follow the manual removal guides below if you want to delete SuperIntext from the computer manually. Afterwards, click the displayed download button to install a free malware scanner. The alternative for this is automatic malware removal. Install a legit, reputable tool to ensure successful SuperIntext removal and Windows protection. The latter is extremely important if you care about your virtual security and you do not want to find uninvited software running on the PC without permission. Find the Start button on the Task Bar and click it. Find the undesirable application and Remove it. Open the Start menu. To do this click the Windows icon on the Task Bar. Right-click SuperIntext staging’ and select Uninstall to complete the removal. Right-click on the Metro UI menu to open a pane at the bottom and click All apps. Click Control Panel and then select Uninstall a program. Locate the application you wish to delete, right-click it and then choose Uninstall. Quick & tested solution for SuperIntext removal.